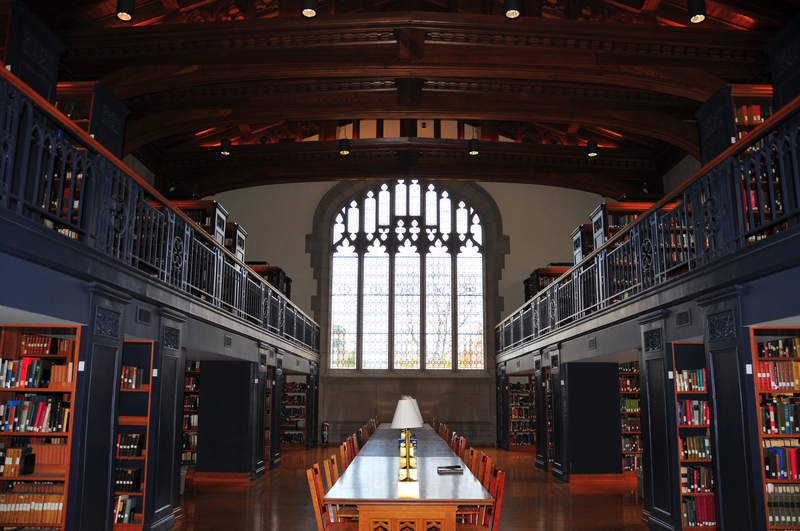 When Vassar opened in 1865, the library was a mere room in Main with an embryo collection of some three thousand books. In 1893 Frederick Ferris Thompson, a Vassar trustee, gave the college an extension to Main hall that served as a library until the new Thompson building was completed in 1905 by Mary Clark Thompson as a memorial for her husband. Mrs. Thompson's continuing generosity enabled the library to be enlarged in 1918, and in 1924 her bequest to the College became an endowment for its support. In 1937 funds derived chiefly from her bequest built the addition to the south which leads to Taylor Hall. That part of the structure is known as the Van Ingen Art Library, in memory of Henry Van Ingen, professor of art at Vassar from 1865 to 1898. From 1961 to 1964, the interior of the Thompson Library was extensively modernized, through the generosity of another former trustee, the late Elizabeth Stillman Williams, of the Class of 1927. Architecturally, the style of the building is perpendicular Gothic, with many embellishments. The general plan of the building is three wings built about a central tower. Rising with buttressed walls, the tower is crowned with battlements and pinnacles. Flanking the entrance, below the ceiling windows in the central hall, is a stone frieze of college and university seals--Cambridge, Oxford, Bryn Mawr, and Smith. On the right above the outside door is the "Veritas" of Harvard; on the left the "Lux et Veritas" of Yale. Below the frieze of seals in the central hall hang five seventeenth-century Flemish Gobelin tapestries portraying Apuleius' romance of Cupid and Psyche. For more information about the seals, see Shields, Seals, and Printers' Marks. The Cornaro Stained-Glass Window was commissioned for the library from a studio in Birmingham, England and installed in 1906. Library facilities were enhanced by the completion of the Helen D. Lockwood Library in 1976. In 2001, another addition was added, the Martha Rivers and E. Bronson Ingram Library. A principal feature of this new addition is the Catherine Pelton Durrell Archives and Special Collections which houses the Francis Fitz Randolph Rare Book Room as well as exhibit, storage, teaching and reading areas. Ingram Library also includes Reserve Services, studies for faculty members, the periodical collections, the Class of 1951 Reading Room, the library classroom and staff offices. A major renovation to Thompson Library was also completed in 2001. The main library collection today contains over one million volumes and 3,500 serial, periodical and newspaper titles, as well as an extensive collection of microfilm and microfiche. 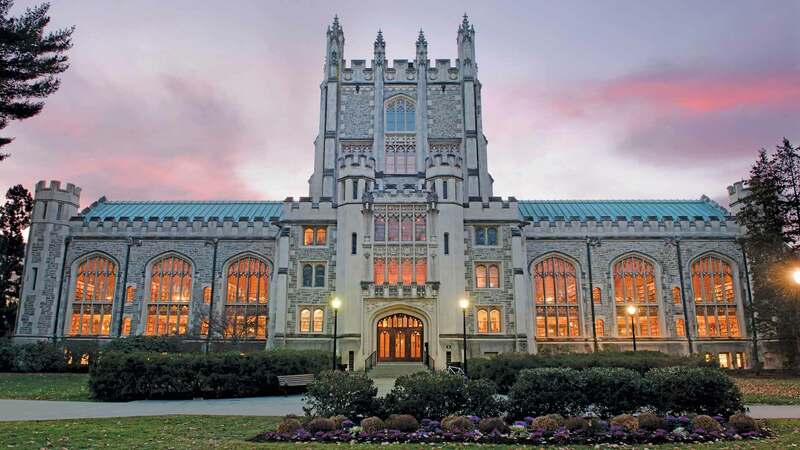 The history of the Libraries and of Vassar College are further chronicled in "The Great Experiment: A Chronicle of Vassar", written by Dorothy A. Plum and George B. Dowell and adapted for the web by Elizabeth A. Daniels, Vassar College Historian.